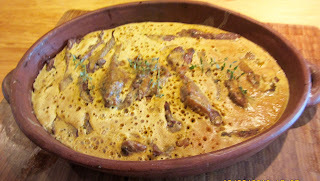 paletilla, 1.shoulder-blade; shoulder of meat such as lamb. 2. meat removed from the shoulder-blades for pork sausages. 3. palette. 4. spatula, kitchen implement with a flat disc attached to a long handle; fire-shovel; iron ladle. 5. chine of pork or pork cutlets, pork or other meat from the spine between the shoulders. 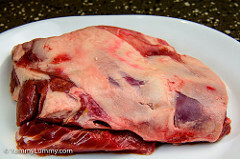 Select a lamb shoulder blade. Slice it into strips. Put it into a pot with seasoning vinegar and 1 tbsp oil. When the meat is half done remove it and fry it in oil in an iron or glazed earthenware pot. < mso-bidi-font-weight: normal;">Beat eggs with flour and breadcrumbs. Add it to the pot with the meat and juices. Let the eggs cook. Pour the contents into a serving platter and enjoy.